Donna Stewart takes readers to some of the spookiest haunts across the state including Oaks Park in Portland where visitors have reported a ghostly apparition of a child in the 1970s style dress, O’Kane Building in central Oregon where people have reported seeing “ghostly smoke” and strange lights, and Pioneer Park in Pendleton where some have reported apparitions and hearing voices. 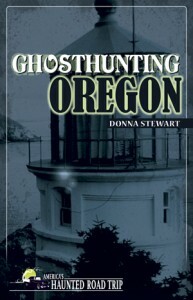 As a native Oregonian, Donna Stewart discovered her interest in the paranormal at a very early age in the early 1980s, a time when very few others were even aware of a paranormal community. In 2004, along with cofounder Laura Schier, Stewart formed PSI of Oregon, working long and hard for a decade to make their team one of the most respected and sought after paranormal research teams in the area. With a copy of Ghosthunting Oregon in hand, readers can visit some of the spookiest haunts across the state and compare their experiences.